A sophisticated, heart felt celebration of lyrics by Lorenz Hart. 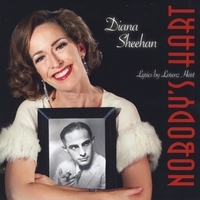 Diana Sheehan is an award-winning actor and singer whose sophisticated style is perfectly suited to the witty and biting lyrics of Lorenz Hart. Diana has performed her cabaret shows at New York's Triad, San Francisco's Plush Room and Boston's Club Cafe championing the American Songbook. Nobody's Hart: the Lyrics of Lorenz Hart was the winner of BEST OF THE LOOP at the 2013 Out of the Loop Fringe Festival in Dallas and enjoyed a sold-out run. Ms. Sheehan debuted Nobody's Hart at The Sammons Center for the Arts. It will be produced next by Amphibian Stage Productions in Fort Worth. For the roles of Edith and Little Edie Beale in Grey Gardens, she received the 2009 Dallas-Fort Worth CRITICS FORUM AWARD and the 2009 COLUMN AWARD for Best Leading Actress in a Musical. Her Dallas-area debut in Irving Berlin's As Thousands Cheer at Lyric Stage also received the Dallas-Fort Worth CRITICS FORUM AWARD. She stood by for Betty Buckley and Tovah Feldshuh in the Dallas Theatre Center's production of Arsenic and Old Lace,and went on for Betty Buckley. Diana appeared as Elsa Schraeder in The Sound of Music at Casa Manana and in Black Pearl Sings at the Watertower Theatre. Most recently, she appeared at the Watertower in Sondheim's Putting It Together. Diana starred in the off-Broadway hit, Forbidden Broadway in New York, Boston and on national tour. Other regional credits include: Adirondack Theatre Festival, San Francisco Shakespeare Festival, American Stage, North Shore Music Theatre, Merrimack Repertory Theatre, Forum Theatre, and the Jewish Theatre of New England. She is a graduate of Smith College. For his poetic ability, his taste, his technical skill, and his profound lyrics that touch our hearts, no lyricist comes closer to Shakespeare than Lorenz Hart. Accordingly, Larry Hart was the first to translate a Shakespearean play into musical theatre. The delicate and elegant internal rhymes in "Mountain Greenery" are an example of his genius. His tragedy is that his genius gave his demons so much self-destructive power. Standing under five feet tall and not especially handsome, Larry felt inferior and hopeless of ever being truly loved. Because of the required closet in his times, he also had to hide who he was. His writing partially, temporarily blocked his feelings of rejection. Sadly, he found a more powerful solution, but it took his life. As is often true with a genius who is also an alcoholic, Larry Hart was able to express the human condition because he felt and experienced it so deeply. The heart-stopping sadness beneath the breezy surface of his lyrics came from the doubt at his core. Hearing a Hart song, we feel the depth of the human condition.....and we sense the greatness that is possible for a few. But oh, the ache in one's soul when he sees, but believes he cannot reach those heights - or be loved for who he is. If only Larry could have known that his talent reached so much closer to the stars than those around him, and if he could have known that he would still be loved and respected, today. What remains is what poured forth from him - brilliant, heart felt songs about loving and being loved. I love Ms. Sheehan's phrasing, humor and honesty in her interpretation of these wonderful old songs. Her voice epitomizes the style of a time gone by, and takes me back, way back in my imagination. Lush and lovely.